If you have spent a summer in Arizona then you understand that the days extend into the triple digits and the air is so sweltering that it just really takes your breath away. Living in this dry, very hot climate takes some getting used to. It is a really good idea to chat with the resident locals and figure out how they deal with the extreme heat and combat the high utility bills in the summer months. People do a lot of different things to keep their homes cool and comfortable, their patios screened and protected so that their kids can play outside, and their utilities from being incredibly high. With a little bit of know how and investment, you too can learn enjoy living in this intense heat. Many families choose to install roll down sun screens on their porch and patio areas so that their families can actually go outside during the heat of the day. These roll down sun shades screen out about 60-80% of the light and heat that shines down. These roll down shades can transform a boiling hot patio into a comfortable place for your kids to play. Some homeowners chose to use a roll out screen over a portion of their swimming pools as well. This protected area over the pool allows homeowners to be able to enjoy their pools even in the heat of the day, instead of only in the early morning and evening. Small children and older people are more apt to want to swim if the pool area has some sun protection for them. Many people also choose to install retractable awnings on their patio areas to protect the area from the heat of the day. 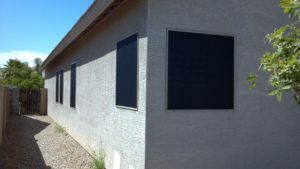 Having sun screens on the windows is also a great added benefit to any home situated in the hot Arizona climate. The sun screens are made of a dense woven fabric or vinyl that provide a sense of security during the day, offer economy and comfort year round, let in soft light and small breezes, and protects your drapes and blinds from sun damage. Sun screens keep your home cooler and more comfortable. After installation of sunscreens you will notice that your home is cooler and more comfortable. You will also notice quite a difference in your utility bills; they will be lower. Sun screens will make a different to the overall comfort in your home. The screens provide a great insulating barrier between the window and the inside of the house. They can be ordered in a variety of colors and textures to match the style of your home.